We strive to create a weekend that is engaging and enjoyable for all. In an exciting and forward-thinking atmosphere, it is our hope that delegates are empowered to push boundaries, be progressive, feel empowered to try things they have never done before... and have fun! It is an honour to present former State Secretary/Deputy Minister with the Norwegian Ministry of Foreign Affairs, Laila Bokhari as our Keynote for April 2019. We look forward to learning more about her long career as a research fellow on political violence, terrorism and radicalisation. Photo courtesy of Tourism Victoria. It is great be returning to the heart of downtown Victoria! Making use of the amazing Victoria Conference Centre and the Parliament Buildings, it is a thrill and an honour to announce that the Canadian House of Commons will be hosted on the floor of the British Columbia Legislature! ShawMUN has always prided itself on offering a plethora of committees and this year is no different. With the mission of creating an environment for all delegates to thinking critically and creatively in mind, the Secretariat team is excited to introduce ShawMUN Victoria 2018’s committees. Meet the ShawMUN Victoria Secretariat! Our secretariat is a group devoted to the success of our annual conference. The people listed display a range of talents and perspectives and have all committed the past few months to the success of this conference. They bid you welcome and hope you enjoy your time with us down here in Victoria! ShawMUN Victoria will once again take place at the Victoria Conference Centre. With a blend of traditional West Coast culture, modern elegance and fine art, the Victoria Conference Centre foster a welcoming atmosphere.This landmark building is one of the most beautiful venues in Western Canada. The centre is located in the heart of downtown Victoria, with many beautiful attractions, restaurants, and activities to enjoy between committees. Want to be a part of a life-changing conference experience? 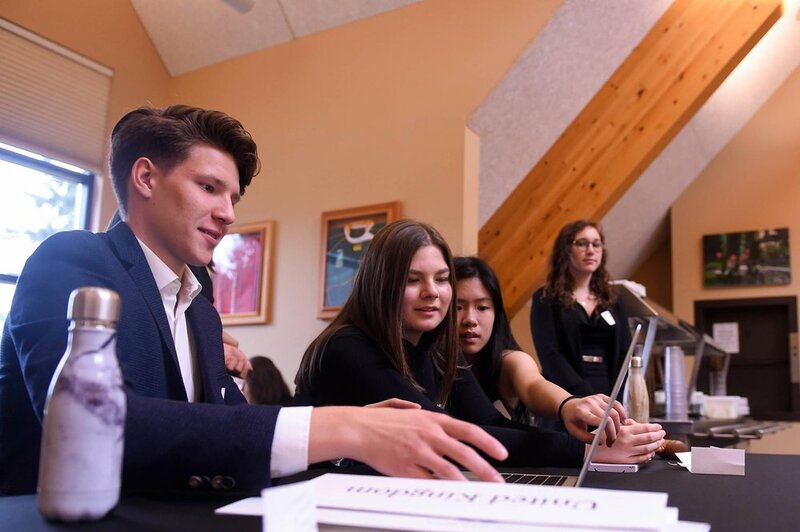 Register now to be part of Shawnigan Lake School’s annual ShawMUN by joining the ShawMUN Victoria taking place April 12-13, 2019 at the Victoria Conference Centre! Click the button below to learn more.